Boeing 787 Dreamliners are still grounded around the globe in February 2013 after the lithium ion battery problems became very bad in January 2012. Boeing says currently that it expects the aircraft to be back in service in late March or April. Something similar, but on a smaller scale, has happened before with laptops bursting into flames because of their lithium ion batteries. This is the sort of problem that an engineer can face when any of her creations takes to the sky or arrives in numbers in the big, bad world. It may an aircraft, a car or a washing machine. It is what sometimes comes after the creative struggle of the Design process. Of course she hopes that the problems are not too terrifyingly large. Now here, though, we have dozens of planes grounded for months and each worth two hundred million dollars [according to the Boeing website]. Nonetheless, dealing with similar things on a smaller scale are part of his job description for any engineer. What information that seems to have seeped into the public prints is that the Lithium Ion batteries have not been adequately cooled and have taken fire. This is not something that aeronautical engineers want to happen to their babies. The aircraft designers or their colleagues, the Power Electronics Engineers, will be looking to see if some fault external to the batteries was the cause or whether the batteries installation has been designed too close together or whether the cooling systems designed for them are not sufficient. The Lad is not a battery design expert, but he knows that lithium ion batteries are more like little furnaces rather than the EVEREADY, zinc oxide dry-batteries of his boyhood ‘tin’ torch. We can discover that like a boxer, pound for pound, these batteries are six times better than the standard lead acid battery in a car. This feature is gold dust for plane design engineers. But as a consequence of this, the lithium components are bursting with energy and therefore can get very hot. This, together with the essential [but flammable] solvent, means that a battery if it is hard-driven is continually on the verge of losing control to a runaway reaction and getting either very hot or even bursting into flames. If it is a battery cooling problem for a modern airliner the solution will not be simple. No one can just say let us move them apart from each other or away from other bits of kit so that then they won’t get so hot. An aircraft may look large roomy and smooth from the outside. In truth, inside there is packed a 3D maze of structure, engines, fuel tanks and cargo…sorry, passengers. Below is a picture that gives an indication of the complexity of the structure even before all the rest of the kit is installed. Agreed! It is not a very informative graphic but it is the only one that seems to be available. 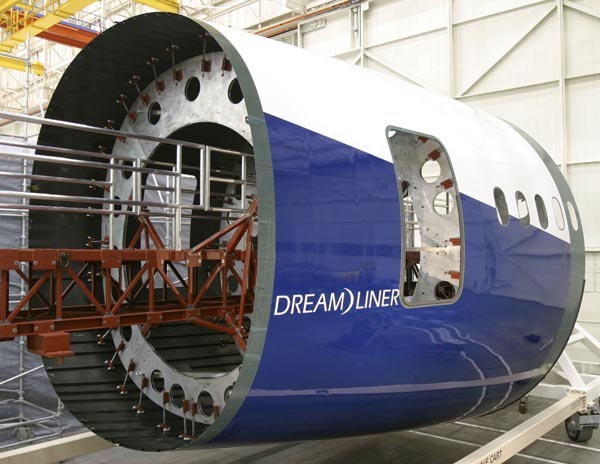 Remember, that the Dreamliner has much clever engineering to allow the use of vast amounts of non-metallic components in its structure. How they do this is a close Boeing secret and not one they are likely to share with anyone in public anytime soon. “Boeing has proposed insulating the battery’s lithium-ion cells from one another to prevent fire spreading, encasing the battery in a fire-proof shell and installing sensors. The view of The Lad is that this can only be seen as a ‘workaround’ rather than a definitive solution which should involve arranging for the batteries not to over-heat. We can only await events. A final thought on those ‘events’ is that, if the experience of The Lad is anything to go by, major problems like this will be astonishingly more complicated than The Lad is able to deduce in this post. The points that he makes above will only be the beginning of the beginning. Such problems will have a large team entirely devoted to solving them. Such a team will consist of dozens of engineers. There will be design and development engineers, metallurgists, electrical and electronic engineers. As a team, they will be working, certainly, seven days a week and probably 24hrs a day. That’s what engineers do: their best efforts sometimes produce a problem so then they have to race to solve it. All the while that they struggle, massive present and future costs result in cash haemorrhaging straight down the drain – to waste. Note that, while Boeing may say all will be well by March or April, at least one major customer airline expecting to be without its planes till May. So – that the above Boeing team list does not include the groups of programme guys working at the airlines. They are struggling to arrange replacement flights for passenger already booked to fly in planes are no longer available. The costs of this group and plane hire will undoubtedly land on the Boeing doormat in due course. It emphasises that the professional engineer must always work with not only the obvious factors of ‘materials’ and the ‘forces’ developed by the machines but also with essential factor of ‘finance’. How about this thought though. Problems such as this Dreamliner may be exhilarating – provided no one thinks that you were to blame. If you are in charge of the team solving them, The Lad guesses, that it can be satisfying. So! If you are the person who says ‘Bring it on!’ then maybe you are a worthy successor to Isambard Kingdom Brunel. Do you want to be an engineer? A change of state for Dyson – back! Sir James Dyson is famous for his engineered products and support for UK engineers and engineering. It is striking that this has come about from his work entirely devoted to domestic appliances. A few years back, The Lad would then have expected that such an engineering reputation would have had to have stemmed from Defence or Aerospace or Power Generation: industries that are awash with finance, opportunities and Research and Development (R&D) departments. Perhaps, alternatively, anywhere in Germany or the US – but we won’t go into that. The air moving device, called the Air Multiplier by Dyson is one of his latest devices and, typically, it is a remarkable example of thinking laterally. That, together with painstaking development, brings a device to replace and improve the standard domestic fan. The vacuum cleaner newly bought by The Lad is the DC41 Animal . 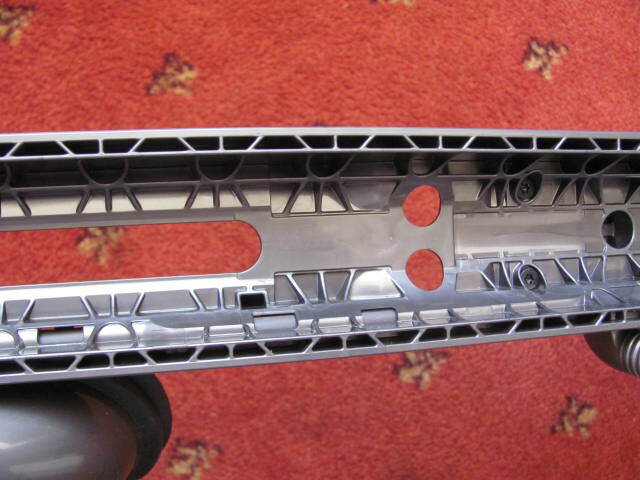 As part of normal usage and maintenance of the cleaner; the internals brought into view reveal an engineering, tour de force of die cast plastic design. That vital component of the engineering design process, the material, used by Dyson is presumably that marvel of an engineering plastic – ABS or a more modern derivative. However the new design cleaner is not without minor glitches. Such glitches though, The Lad emphasises are part of a normal engineering development of even the highest level product. There is also a much more interesting effect that we will come to after a mention of the glitches. The On/Off power switch has nowhere near the snap action [as in a light switch on the wall] that this user expects. A stab action of the finger frequently leaves the motor still running. That’s one. The other concerns the power flex, or cord. It is longer, which is good, but is not so easy to handle as was the flex of The Lad’s previous Dyson. It does not coil in the hand comfortably. 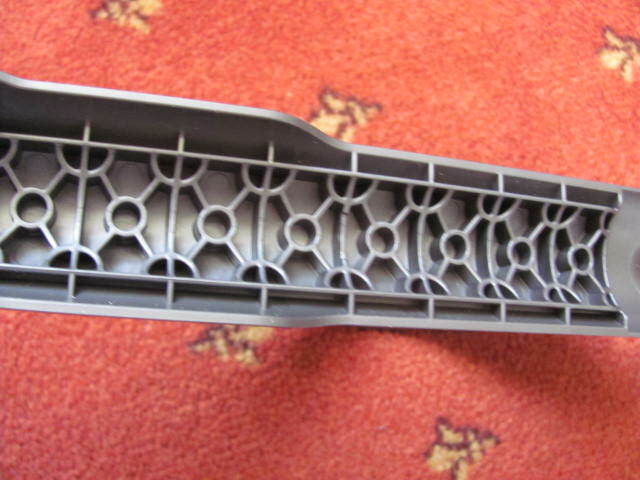 Possibly the insulation elastomer is slightly too stiff in shear or there are inbuilt stresses. Either could lead to torsional coiling problems. Now we come to the interesting thing. Think about this. The Animal cleaner is definitely a more elegant engineering design than the products of other companies and also its Dyson predecessors. Also, the design morphology is different in that the filters are in different locations in the air flow path. Despite this, the design is now back to the starting point. This starting point was a vacuum cleaner with a bag [which is a filter of course] that had to be changed; the dust collection efficiency declining if it was not. From the user’s point of view; which has to be the engineer’s Gold Standard, things are now much the same as they were. Dyson recommends washing the 2 filters in the Animal every 3 months. Their extraction is as inconvenient as was changing a bag and the washing of the filters and their 24 hr drying time [perhaps longer in winter in the UK] is more inconvenient. So here we are. 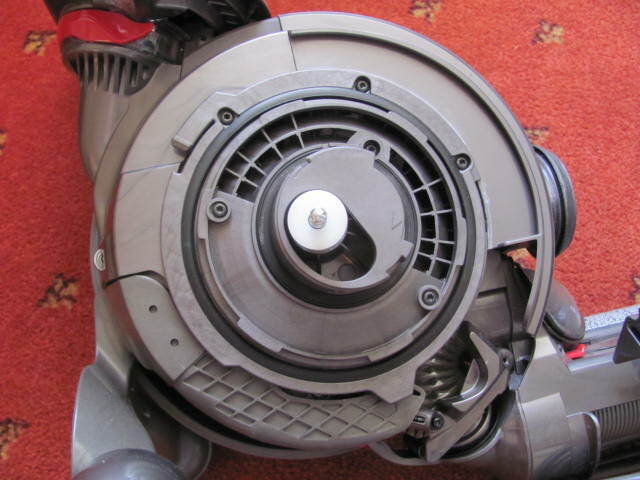 This is a vacuum cleaner design that demands that its large filters have a 24 hr maintenance process to avoid loss of efficiency. The clever and elaborate cyclone technology is being overshadowed by the old [paper in one case] filter technology. One of the filters is in the shape of a bag. Sir James had better not let his engineers go any further down this design branch! Posted on February 4, 2013 February 4, 2013 Categories Current News, Design in the World, Engineers in the World, Uncategorized, Views1 Comment on A change of state for Dyson – back! It was April 1st 2009 and the Eurocopter Super Puma L2 helicopter was expecting to land at Aberdeen at 1314 hrs. This was still 20 minutes away but, at the 2000 feet cruising altitude, the coast landfall 10 miles away was just in sight. Below, was a modern, powerful, rig supply ship, the ‘Normand Aurora’, on a so-far uneventful trip. Someone on watch on the bridge changed all that. It was good visibility and there was a shocked shout of alarm. Two miles away, the helicopter was hurtling into the sea with separated rotor following it. Then came the bangs, the black smoke and the explosion. The ship swung towards the smoke. Normand Aurora was the nearest ship to the crash site and rushed to the rescue. Launching their fast,-rescue inflatable. It hit the water with a loud slap and accelerated away. Leaving the mother ship quickly far behind as its helmsman gripped the steering wheel with white knuckles and stiff-armed the throttle fully forward. He and his crew were desperate with hope that there would be something that they would be able to do: that there would be someone that they could help among the unfortunates in the helicopter cabin that had plummeted into the sea at high speed. But fearful at the same time. After the headlong two miles, its crew found a large circle of churning water. Within there were life rafts and debris. They also saw eight people; none were alive. Recovered from the sea bottom. Note the missing pinion at four o'clock. Above are planet gears from the downed helicopter showing corrosion from their immersion in the sea. They are without an outer casing destroyed in the accident. There should be eight gears but it can be seen that one is missing. The destruction of the one, missing planet gear was the cause of the tragedy. Above shows only a part of the gear boxes and trains in the Super Puma [and other similar helicopters]. Had there been no advance warning of the impending catastrophe at all? The drive shaft from each of the two engines in the helicopter runs at 23 000rpm [that is, the internals of each engine is rotating 380 times in one second or around 5 times as fast as a family car engine!]. The main rotor blades rotate at 265rpm. This means that the helicopter design engineer had to design a gear box to give a reduction of nearly a factor of 100. It has to fit in as small space and have as low a weight as possible. When the designer needs to slow down the rate of rotation of a shaft by a large amount like this, she usually goes for an epicyclic gear design. These are commonly known as a sun and planet gear sets. This is what is found in a Super Puma between the fast spinning engines the relatively slowly rotating main rotor. This epicyclic design was shown in the textbooks of The Lad like this, and similar diagrams are still shown today. The textbook version is rather lightweight compared to the real thing. In real life where very large power has to be transmitted in as small a space as possible, there are more planet gears than in the textbook diagram. They fill the circumference and each is wide and massive. Such planets of half of the Super Puma epicyclic gear train are shown in the salvage photograph above. Even though the designers seek to make engines and gearboxes as reliable and free from the risk of components failing as possible there is still a need to keep a check on machinery health. For a Power Station generator or a car engine there is no great, inherent problem to be anticipated if it rapidly comes to a halt after 30 sec of noisy running. It is quite a different problem if the engine is powering an aircraft flying several miles high over the ocean. Here a significant risk of such a sudden stop is not acceptable. They must head off such failures before they happen. They must search for signs of any problems well in advance. The magnetic chip detector is one of the neat ideas that help maintenance teams do this. It is a simple concept. Many of the most highly stressed components are made of steel which is magnetic. One of the commonest symptoms of failure, when such a component wears or suffers fatigue cracking, is that chips of metal are generated and released from the parent component. The oil, as it is circulated throughout the engine, washes such chips away and usually takes it to the lowest part of the engine. En route, if it washes over a single small magnet, it will be captured by the magnet. The maintenance team simply unscrew the magnets at regular intervals and an early alarm can be raised if any chips are found sticking to the magnet. Such detectors are positioned at various places within the engine oil flow where any chips may be washed over them. An alternative design is to provide twin magnets close together. Coupled to this type of device is a power supply and electronic detector to signal to the helicopter pilots, even in flight, when a chip bridges the two magnets. Such a design is shown below. There are many such detectors designed into the Super Puma. Several are in the vicinity of the main gear box. The design of such detectors is another one of the many examples of the nexus where the design principle of “simple and reliable” approaches close to the principle of “too crude for the risk burden”. The designer has to consider which is the truth in every such case. Did the detectors work this time or not? If not, why not? See the next post. Engineering turns the forces to the benefit of mankind and the results have immense consequences. These consequences are, on the whole, beneficial but sadly, as with any efforts of the human race, for some individuals can be malign. Bloody skirmishes to understand each way that a structure can fail and to avoid them all are a repetitive feature in engineering history. For ordinary structures most of the skirmishes have been avoided and, nowadays, fewer new ones appear. But fresh demons occasionally burst forth to confound us in new campaigns to complete new tasks or use new materials. When they do, they extract their price in blood or treasure. Professional engineers have to be continually alert. The engineer knows that the nature of her or his work usually brings great benefit. But it can, also on occasion, bring tragedy. So it was with G-REDL on 1st April 2009.